The holidays are upon us. Get togethers with family, holiday parties, Christmas shopping, caroling, and building snowmen pepper most of our free time during this busy season. Yet, most of us love it. The holidays are times to celebrate life and all the adventures life brings. For those of us who love off-roading, the holiday season and winter means a major slow-down to our outdoor fun. It’s cold out, so riding in our Jeep is not quite as much fun. Weather may prevent us from accessing our favorite off-road spots. Snow may altogether impede us. However, the winter weather shouldn’t mean a complete halt to off-roading. Off-Road Rim Financing, the Top Rated Local® Off-Road Payment Plan provider, loves winter. Winter can offer a unique set of challenges for off-roading that makes enduring the cold worthwhile. Off-roading shouldn’t stop because of the holidays. 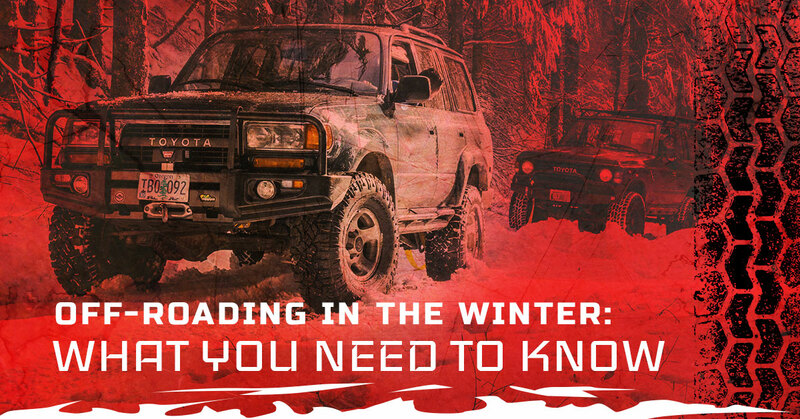 Below is what you need to know to keep off-roading even in the winter months. The extra traction from your 4×4 still applies in the winter. Your off-road tires function just as well. What’s different is the stopping power, which is not as quick in adverse weather. However, since off-roading involves slower speeds, this is a non-factor. Know what type of 4-wheel drive system your vehicle has. There are two systems: “part-time” and “full-time” systems. A part-time system gives you better traction on slippery surfaces (such as when the surfaces are covered with a solid sheet of snow or ice) because the front and rear sets of wheels are locked together. However, you need to switch to 2-wheel drive on dry pavement in order to avoid wear on the drivetrain. A full-time system allows a little slip between the front and rear wheels, which makes it safe for dry pavement. A full-time system is driver-friendly because you can put it in 4-wheel drive and leave it when you’re driving on a road with intermittent patches of ice and snow with dry pavement in between these patches. Know what type of off-road tires you have. Not all tires are created the same, and this holds true for off-road tires as well. While off-road tires function in essence the same, their capability in wintry weather is specialized. Check out Off-Road Rim Financing’s selection of off-road tires and off-road rims. You can often save money if you purchase your off-road wheels as a set. Prepare for the weather. If you’re going to be spending a significant amount of time off-roading in wintry weather, you’re best bet is to invest in snow off-road tires. This will allow you to not use chains except in the most inclement weather conditions. Also, Off-Road Rim Financing recommends having your tires siped — the process of creating tiny slits in your tires in order to increase traction and stopping power. This process is recommended on all your tires for the exact same reason as above. Most tire stores have a sipping machine and can do this for you. Like most tires, snow off-road tires will need to be broken in ahead of time, so pre-planning is essential here. Another option is studded snow off-road tires. Like they sound, these tires have studs placed into the tread to gain traction in the winter. However, these tires are best for ice and snow and give less traction on dry pavement because the studs elevate the tire, reducing the grip on the surfaces. Keep up on your vehicle maintenance. Like always, make sure your vehicle is running at optimal condition, especially during off-roading in the winter months. Check your fluids (especially window-washer fluid), oil, and transmission fluid. Make sure your windshield wipers are working, and have your brakes checked. And, most importantly, make sure your heater and defrost are working to make off-roading as pleasant as possible during the cold. An ice scraper is your friend. No one likes trying to see through a tiny peep hole at the bottom of his or her windshield, while shivering and wishing you had never agreed to go on this trip because something is wrong with your vehicle simple maintenance could have fixed. Make sure your battery is a good one. Batteries don’t like to cooperate when the weather gets cold. It has to work harder when your oil is cold and is not as efficient. A dead battery can be life-threatening in a remote location in the middle of a snowstorm. Off-Road Rim Financing recommends investing a good battery or two if you plan to be using your winch a lot. Know the weather. This common-sense piece of advice is often forgotten in the long list of to-dos before a trip. Are you climbing in altitude where there might be snow? Will you be crossing mountain paths? Is the blizzard of the century predicted? The lesson here is to be prepared for the worst no matter what. Tell others of your travel plans. Again, a common-sense tip that is often forgotten. Let your friends and family know where you will be going, so if the worst does happen, you can be located quickly and brought to help. If possible, go off-roading with a buddy during the winter season. Off-roading with friends is fun and can add to the joy of your trip. Off-Road Rim Financing is passionate about enabling off-roading for enthusiasts. We sell off-road rims, off-road tires, off-road wheels, and numerous other off-road accessories for your vehicle, such as truck lift kits, bumpers, exhausts, and programmable chips. We offer incredible financing/leasing options, enabling you to enjoy your off-road trips today instead of in six months. We offer several credit options, including no credit check financing for your off-road wheels. Off-Road Rim Financing has helped thousands of people like yourself enjoy the pleasures of off-roading, the wonders of nature, and the achievement of going places most others never go. Off-roading is exhilarating, challenging, and fun. No two paths are the same — and that’s how us off-roaders like it. Contact us today for all of your off-road wheel needs today!